A significant technical impediment to any Regency Bill involved the lack of a speech from the throne, which was necessary before Parliament could proceed to any debates or votes. The speech was normally delivered by the King, but could also be delivered by royal representatives known as Lords Commissioners; but no document could empower the Lords Commissioners to act unless the Great Seal of the Realm was affixed to it. The seal could not be legally affixed without the prior authorisation of the sovereign. Pitt and his fellow ministers ignored the last requirement and instructed the Lord Chancellor to affix the Great Seal without the King's consent, as the act of affixing the Great Seal in itself gave legal force to the bill. This legal fiction was denounced by Edmund Burke as a "glaring falsehood", as a "palpable absurdity", and even as a "forgery, fraud". 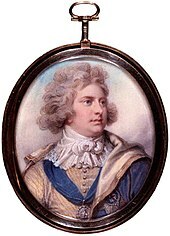 The Duke of York, described the plan as "unconstitutional and illegal." Nevertheless, others in Parliament felt that such a scheme was necessary to preserve an effective government. Consequently, on 3 February 1789, more than two months after it had convened, Parliament was formally opened by an "illegal" group of Lords Commissioners. The Regency Bill was introduced, but before it could be passed the King recovered. The King declared retroactively that the instrument authorising the Lords Commissioners to act was valid. George was rumoured to have fathered several illegitimate children. James Ord (born 1786)—who moved to the United States and became a Jesuit priest—was reportedly his son by Fitzherbert. The King, late in life, told a friend that he had a son who was a naval officer in the West Indies, whose identity has been tentatively established as Captain Henry A. F. Hervey (1786–1824), reportedly George's child by the songwriter Lady Anne Lindsay (later Barnard), a daughter of the 5th Earl of Balcarres. Other reported offspring include Major George Seymour Crole, the son of theatre manager's daughter Eliza Crole or Fox; William Hampshire, the son of publican's daughter Sarah Brown; and Charles "Beau" Candy, the son of a Frenchwoman with that surname. 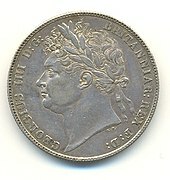 Anthony Camp, Director of Research at the Society of Genealogists, has dismissed the claims that George IV was the father of Ord, Hervey, Hampshire and Candy as fictitious. The problem of the Prince of Wales's debts, which amounted to the extraordinary sum of £630,000 (equivalent to £Udtryksfejl: Uventet tegnsætning-tegn: "[" today) in 1795, was solved (at least temporarily) by Parliament. Being unwilling to make an outright grant to relieve these debts, it provided him an additional sum of £65,000 (equivalent to £Udtryksfejl: Uventet tegnsætning-tegn: "[" today per annum). In 1803, a further £60,000 (equivalent to £Udtryksfejl: Uventet tegnsætning-tegn: "[" today) was added, and George's debts of 1795 were finally cleared in 1806, although the debts he had incurred since 1795 remained. In late 1810, George III was once again overcome by his malady following the death of his youngest daughter, Princess Amelia. Parliament agreed to follow the precedent of 1788; without the King's consent, the Lord Chancellor affixed the Great Seal of the Realm to letters patent naming Lords Commissioners. The letters patent lacked the Royal Sign Manual, but were sealed by request of resolutions passed by both Houses of Parliament. 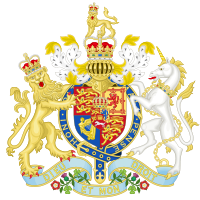 The Lords Commissioners appointed by the letters patent, in the name of the King, then signified the granting of Royal Assent to a bill that became the Regency Act of 1811. Parliament restricted some of the powers of the Prince Regent (as the Prince of Wales became known). The constraints expired one year after the passage of the Act. The Prince of Wales became Prince Regent on 5 February 1811. On 10 May 1812, Perceval was assassinated by John Bellingham. The Prince Regent was prepared to reappoint all the members of the Perceval ministry under a new leader. 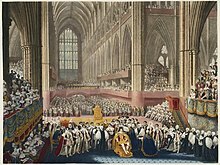 The House of Commons formally declared its desire for a "strong and efficient administration", so the Prince Regent then offered leadership of the government to Richard Wellesley, 1st Marquess Wellesley, and afterwards to Francis Rawdon-Hastings, 2nd Earl of Moira. He doomed the attempts of both to failure, however, by forcing each to construct an all party ministry at a time when neither party wished to share power with the other. 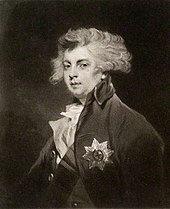 Possibly using the failure of the two peers as a pretext, the Prince Regent immediately reappointed the Perceval administration, with Robert Jenkinson, 2nd Earl of Liverpool, as Prime Minister. The Tories, unlike Whigs such as Earl Grey, sought to continue the vigorous prosecution of the war in Continental Europe against the powerful and aggressive Emperor of the French, Napoleon I. An anti-French alliance, which included Russia, Prussia, Austria, Britain and several smaller countries, defeated Napoleon in 1814. In the subsequent Congress of Vienna, it was decided that the Electorate of Hanover, a state that had shared a monarch with Britain since 1714, would be raised to a kingdom, known as the Kingdom of Hanover. On 30 December 1814, the Prince Regent signed and ratified the Treaty of Ghent which ended the War of 1812 with the United States. Napoleon returned from exile in 1815, but was defeated at the Battle of Waterloo by Arthur Wellesley, 1st Duke of Wellington, brother of Marquess Wellesley. George's coronation was a magnificent and expensive affair, costing about £243,000 (approximately £Udtryksfejl: Uventet tegnsætning-tegn: "[" in 2019; for comparison, his father's coronation had only cost about £10,000, less than a twentieth of George IV's). Despite the enormous cost, it was a popular event. In 1821 the King became the first monarch to pay a state visit to Ireland since Richard II of England. The following year he visited Edinburgh for "one and twenty daft days". His visit to Scotland, organised by Sir Walter Scott, was the first by a reigning British monarch since the mid-17th century. George's heavy drinking and indulgent lifestyle had taken their toll on his health by the late 1820s. 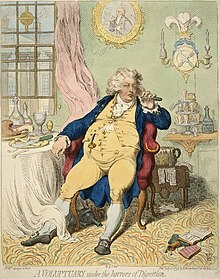 While still Prince of Wales, he had become obese through his huge banquets and copious consumption of alcohol, making him the target of ridicule on the rare occasions that he appeared in public; by 1797 his weight had reached 17 stone 7 pounds (111 kg; 245 lb). By 1824, his corset was made for a waist of 50 inchs (130 cm). He suffered from gout, arteriosclerosis, peripheral edema ("dropsy"), and possibly porphyria. In his last years, he spent whole days in bed and suffered spasms of breathlessness that would leave him half-asphyxiated. By December 1828, like his father, George was almost completely blind from cataracts, and was suffering from such severe gout in his right hand and arm that he could no longer sign documents. In mid-1829, Sir David Wilkie reported the King "was wasting away frightfully day after day", and had become so obese that he looked "like a great sausage stuffed into the covering". The King took laudanum to counteract severe bladder pains, which left him in a drugged and mentally handicapped state for days on end. In 1830 his weight was recorded to be 20 stone (130 kg; 280 lb). By the spring of 1830, George's imminent end was apparent. Attacks of breathlessness due to dropsy forced him to sleep upright in a chair, and doctors frequently tapped his abdomen to drain excess fluid. He was admired for clinging doggedly to life despite his obvious decline. He dictated his will in May and became very devout in his final months, confessing to an archdeacon that he repented of his early dissolute life, but hoped mercy would be shown to him as he had always tried to do the best for his subjects. At about half-past three in the morning of 26 June 1830 at Windsor Castle, he reportedly called out "Good God, what is this? ", clasped his page's hand, said "my boy, this is death", and died. An autopsy conducted by his physicians revealed he had died from upper gastrointestinal bleeding resulting from the rupture of a blood vessel in his stomach. A large tumour "the size of an orange" was found attached to his bladder, and he had an enlarged heart surrounded by a large fat deposit and heavily calcified heart valves. He was buried in St George's Chapel, Windsor Castle, on 15 July. His only legitimate child, Princess Charlotte of Wales, had died from post-partum complications in 1817, after delivering a stillborn son. The second son of George III, Prince Frederick, Duke of York and Albany, had died childless in 1827, so the succession passed to the third son of George III, Prince William, Duke of Clarence, who reigned as William IV. 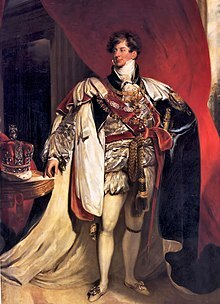 Se også: Cultural depictions of George IV of the United Kingdom. There are many statues of George IV, a large number of which were erected during his reign. 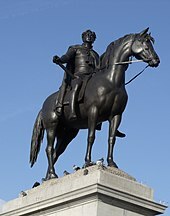 In the United Kingdom, they include a bronze statue of him on horseback by Sir Francis Chantrey in Trafalgar Square and another outside the Royal Pavilion in Brighton. At birth, he was also entitled to the dignities Prince of Great Britain, Electoral Prince of Brunswick-Lüneburg and Duke of Rothesay. Under the Act of Parliament that instituted the regency, the prince's formal title as regent was "Regent of the United Kingdom of Great Britain and Ireland". As Prince of Wales, George Augustus bore the royal arms (with an inescutcheon of Gules plain in the Hanoverian quarter), differenced by a label of three points Argent. The arms included the royal crest and supporters but with the single arched coronet of his rank, all charged on the shoulder with a similar label. 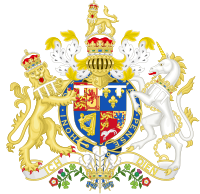 His arms followed the change in the royal arms in 1801, when the Hanoverian quarter became an inescutcheon and the French quarter was dropped altogether. The 1816 alteration did not affect him as it only applied to the arms of the King. ^ Peters TJ, Wilkinson D (2010). "King George III and porphyria: a clinical re-examination of the historical evidence". History of Psychiatry 21 (81 Pt 1): 3–19. doi:10.1177/0957154X09102616. PMID 21877427. ^ a b May, Thomas Erskine (1896). 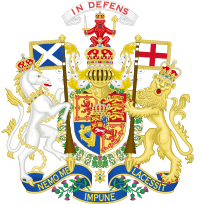 The Constitutional History of England Since the Accession of George the Third, 1760–1860 (11th udg.). London: Longmans, Green and Co. chapter III pp.184–95. ^ a b c d UK CPI inflation numbers based on data available from Gregory Clark (2016), "The Annual RPI and Average Earnings for Britain, 1209 to Present (New Series)" MeasuringWorth. ^ Ashley, Mike (1998). The Mammoth Book of British Kings and Queens. London: Robinson. s. 684. ISBN 1-84119-096-9. ^ Innes, Arthur Donald (1915). A History of England and the British Empire, Vol. 4. The MacMillan Company. s. 50. ^ London Gazette: no. 16451, page 233, 5 February 1811. ^ Rutherford, Jessica M. F. (1995). The Royal Pavilion: The Palace of George IV. Brighton Borough Council. s. 81. ISBN 0-948723-21-1. ^ Innes, Arthur Donald (1915). A History of England and the British Empire, Vol. 4. The MacMillan Company. s. 81. ^ Innes, Arthur Donald (1915). A History of England and the British Empire, Vol. 4. The MacMillan Company. s. 82. 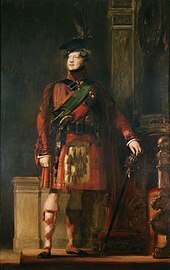 ^ King George IV. Official website of the British monarchy. Hentet 18 April 2016. ^ Baker, Kenneth (2005). George IV: a life in caricature. Hudson and Thames. s. 202. ISBN 978-0-500-25127-0. ^ Innes, Arthur Donald (1915). A History of England and the British Empire, Vol. 4. The MacMillan Company. s. 105. ^ Camden's history. Camden Council. Hentet 5 March 2007. ^ "History". St Clement's Church, King Square. Hentet 3 April 2015. ^ a b c d e f g h i j k Cokayne, G. E. (1910), Gibbs, Vicary, (red. ), The complete peerage of England, Scotland, Ireland, Great Britain and the United Kingdom, 4, London: St Catherine's Press, s. 450–451. ^ Jørgen Pedersen (2009) (på da). Riddere af Elefantordenen, 1559–2009. Syddansk Universitetsforlag. ISBN 978-87-7674-434-2. ^ (på dutch)Militaire Willems-Orde: Wales, George Augustus Frederick, Prince of. Ministerie van Defensie. Hentet 12 March 2016. 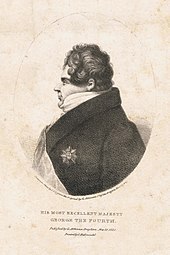 ^ Francois R. Velde. Heraldica – British Royalty Cadency. Heraldica.org. Hentet 11 May 2013. ^ London Gazette: no. 15324, page 2, 30 December 1800. ^ Pinches, John Harvey; Pinches, Rosemary (1974). The Royal Heraldry of England. Heraldry Today. Slough, Buckinghamshire: Hollen Street Press. s. 228–229. ISBN 0-900455-25-X. ^ London Gazette: no. 17149, page 1237, 29 June 1816. Denne side blev senest ændret den 6. januar 2019 kl. 13:11.